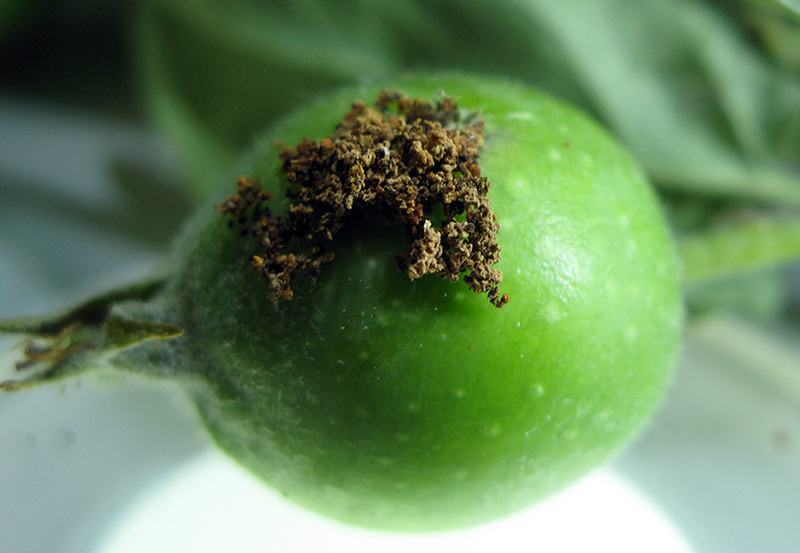 Two codling moth eggs on apple skin, nearing time to hatch. Newly hatched codling moth larva just under the apple skin. Codling moth entry in a young apple fruit. View a pdf of the spray timing table. Be sure to read the instructions at the top of the page, for how to understand the table. Codling moth is a pest that needs to be treated all season long for clean fruit. Codling moth treatment timing is coming up in mid-May for many areas of northern Utah. Dates for the remaining locations will be provided when available. The table of dates provides two options for managing the first generation. 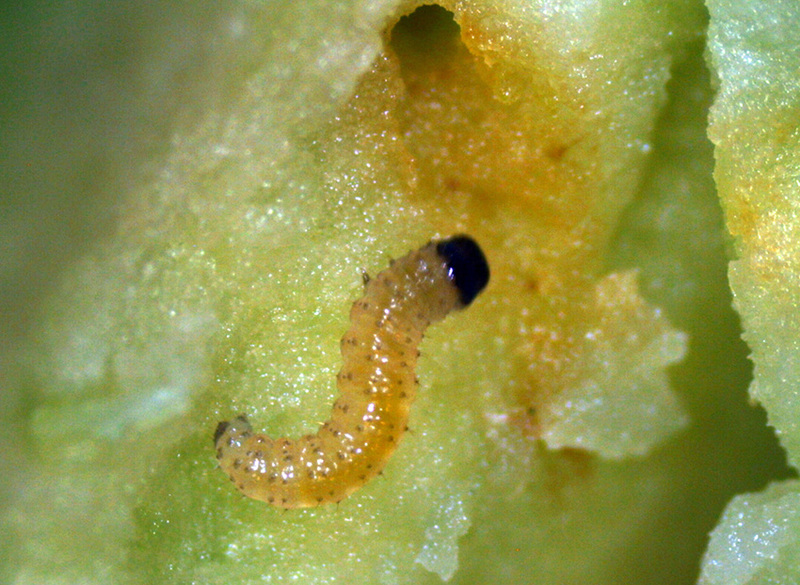 “Option A” is the traditional method, where the first insecticide coincides with egg hatch. So the spray application would target young larvae, which may occur on fruitlets or on leaves. 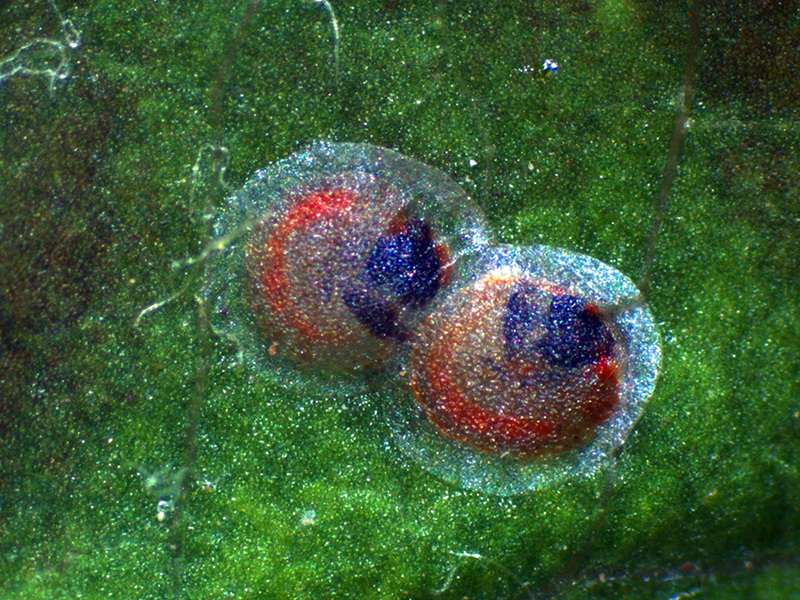 “Option B” targets the eggs themselves with horticultural oil. A 1% application will smother all eggs laid up to that point, providing a “clean slate.” Then, an insecticide application is made later, targeting the larvae that will begin hatching from the new set of eggs laid after the oil application. This option has provided excellent control in many Pacific Northwest orchards, and also saves at least one insecticide spray. Spray options for commercial growers. The table below provides some options for backyard trees. It is important to know how long your spray application will last. For the product you are using, check the “active ingredients” on the front label of your product (in small print on the lower right or left of the label). Sometimes there are several ingredients, sometimes, just one. Some materials last longer than others, and the time between sprays is not always listed on the label. 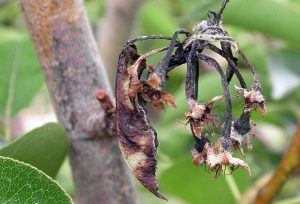 Fire blight is caused by a bacteria, and infections primarily start in open flowers. The risk for fire blight infections is EXTREME for all locations in northern Utah. This is only a concern if there are still any open blossoms on apple or pear. Remember that the late flowers are often the most “dangerous” for new infections. Spray options for commercial growers: In areas of streptomycin resistance, the use of Kasumin plus a half-rate of Mycoshield provides excellent control. For backyard growers, you can purchase “Fire Blight Spray” or “Streptomycin Spray” at local garden centers. On peaches, apply fungicide shuck split stage. Afterward, apply fungicide before or right after 4-hr rainfall to peach, nectarine, or apricot. 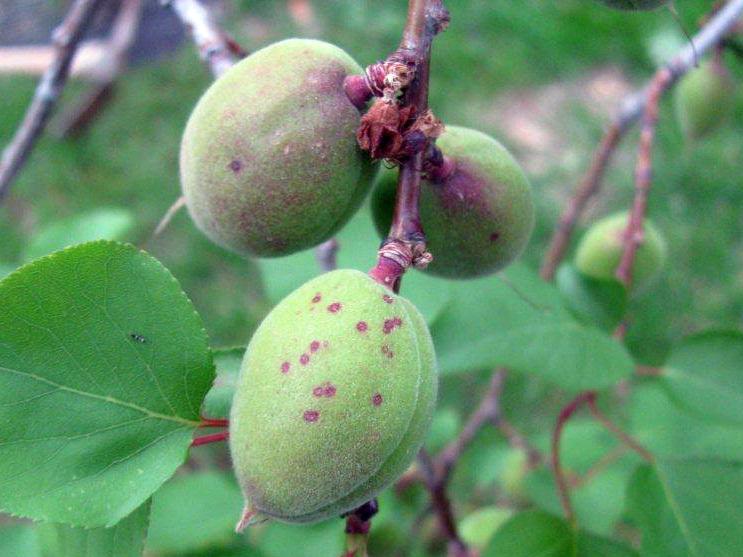 Early coryneum infections on fruit appear as purplish spots. There is a chance of rain for northern Utah Friday and Saturday of this week (May 10,11). When temperatures are warm (above 75), all that is needed is 4 to 6 hours of rain to cause new infections. Keep an eye on the weather and amount of rainfall to estimate whether a fungicide application might be needed. Captan is only effective when applied before a rain. Spectracide Immunox can be applied before or after a rain, but when applied after rain, it may not provide complete protection from infection. The only organic option is Natural Guard Copper Soap. It should be applied before a rain. If raspberry horntail has been a problem, treat for adults between May 25 and May 31 for areas along the Wasatch Front. 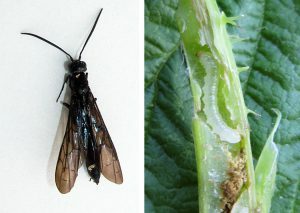 Adult raspberry horntails are sawflies, and their larvae feed inside the tops of raspberry canes, making them wilt over. Often, pruning out infested canes is sufficient management. Raspberry horntail is a sawfly that lays eggs in canes. 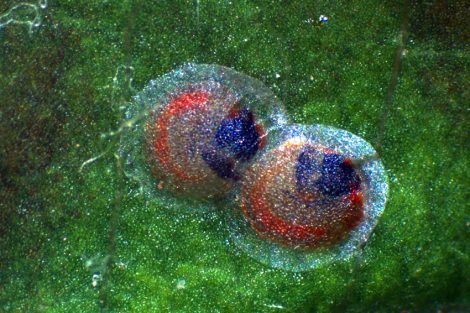 The eggs hatch into larvae that then feed inside the upper canes, causing the tops to wilt and die. Adult horntails will soon begin emerging from canes that were infested last year, towards the end of May. 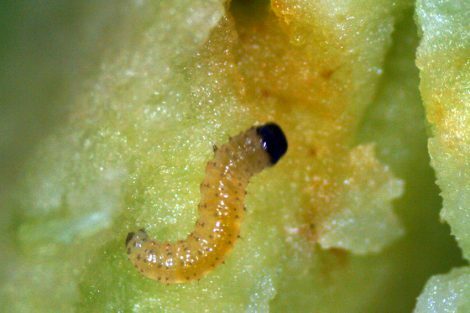 If raspberry horntail is a problem in your area, an insecticide application to prevent egg-laying should go on May 25-31 for areas along the Wasatch Front (one week later in cooler areas). Synthetic pyrethroids (or the organic, pyrethrin) and Sevin are effective. Spinosad is another option, but unproven. A second application should be applied 10-14 days later, depending on product residual and when bloom time is projected to begin. Avoid treating during bloom.